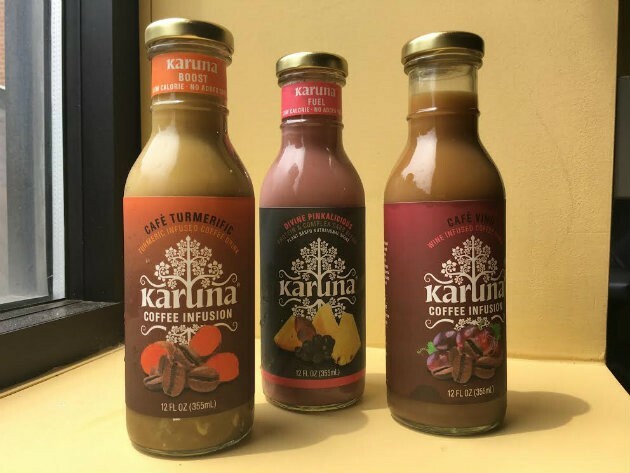 Karuna drinks are a St. Louis-based alternative. Karuna founder Angela Zeng though she was doing the right thing. As a mother, she tried her best to make healthy choices for her children — organic food, fresh fruits and vegetables, no soda. Naturally, she was excited when cold-pressed juices hit the market, making it possible to provide a wholesome, nutritious beverage to her kids without having to personally work a juicer. Or so she thought. "I flipped over the bottle on its side and was shocked when I read the nutrition label," Zeng recalls. "There were 60 grams of sugar in the bottle — granted, a bottle is technically a serving and a half, but still, that's basically like eating five Krispy Kreme doughnuts. I might as well just have been giving them ice cream. They make these claims to be healthful, but they're just not true. I should know. I was in the industry." Indeed, if anyone was in a position to understand the ins and outs of truth in juice advertising, it was Zeng. A biochemist, medical researcher and holder of a Ph.D in pathology, Zeng has devoted the better part of her career to nutrition science, looking at the ways that the food we eat effects our overall health. She later worked for a pharmaceutical company before being recruited by a Chinese juice company seeking to bring its product to the U.S. — an experience that opened her eyes. Says Zeng, "It's what got me into the beverage industry because what I saw made me disturbed." It also led her to her new company — Karuna, a line of plant-based superfood drinks based right here in St. Louis. Zeng was shocked by two things about the juice industry. The first is the amount of waste produced in making cold-pressed juices. Only 30 percent of actual product goes into juice, she says. The rest goes into the garbage and hits the landfill. "Food waste is one of the largest sources of methane in the environment," Zeng explains. "If the industry doesn't make a change, we're not going to be able to feed ourselves." However, sustainability was not her only concern. As Zeng explains, she was increasingly disturbed by the misleading claims made by alleged healthy products. "When you hear the words 'natural' or 'organic,' you assume 'healthy,' but that's not necessarily true," says Zeng. "A lot of these products may be plant-based, but they're not necessarily using quality ingredients, or the ingredients they are using are purified with so many chemicals and left in a state the body cannot absorb. Even if an ingredient is 'good for you,' consuming it this way gives you none of the benefits." With her background in both biochemistry and the juice industry, Zeng knew she could do better. She founded Karuna early this year as a way to answer what she felt was a need for healthy beverages, made sustainably, with an eye to convenience. Over the course of the year, Zeng developed eight different beverages using ingredients not typically thought of in the juice industry, including turmeric, aronia berries, chestnuts and even mung bean sprouts grown hydroponically in her downtown production facility. The results of her efforts are drinks that boast a unique, subtly sweet flavor profile, such as her Divine Pinkalicious protein drink, a tart, pineapple-forward beverage that blends mung bean pulp with quinoa, flaxseed, aronia berry and monk fruit extract. Recently, Zeng has begun experiencing with a line of coffee infusions, something she admits comes from a need for a caffeine boost and a distaste for plain black coffee. Currently, she has two blends on the market. The first, Cafe Vino, is an alcohol-free infusion that marries coffee that's been aged in red wine barrels with Chinese dates and cacao nibs. The second, Cafe Turmeric, is her coffee-based answer to chai tea, a delightful melange of coffee, coconut cream, Chinese dates and black soybeans that leaves a pleasant spicy kick on the finish. Zeng believes her products will appeal to anyone interested in the relationship between what we eat and how it affects our overall health and the health of our environment. 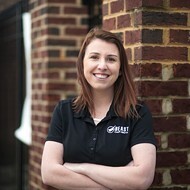 She chose St. Louis as the base of her operations not only because it has been her home for the past twenty years, but because she feels it's the right market. "Everyone kept telling me that I would have no luck if I launched Karuna in the Midwest," says Zeng. "They kept telling me to move it to California because no one cares about healthy living here. I don't believe that. We're having great success here. People like to support local businesses, and we have many people here who want to live healthy lifestyles." Currently, Karuna is available in 24 stores around town, including Whole Foods, Straub's and Dierberg's. Though she plans to eventually expand out of the area, Karuna is currently more of a boutique operation which allows her to focus on product development and consumer education. "Can you believe where we're located," laughs Zeng. "We're right across the street from the Department of Health. Really, that's what we want to do — to help people make healthy decisions whether they buy our products or not."